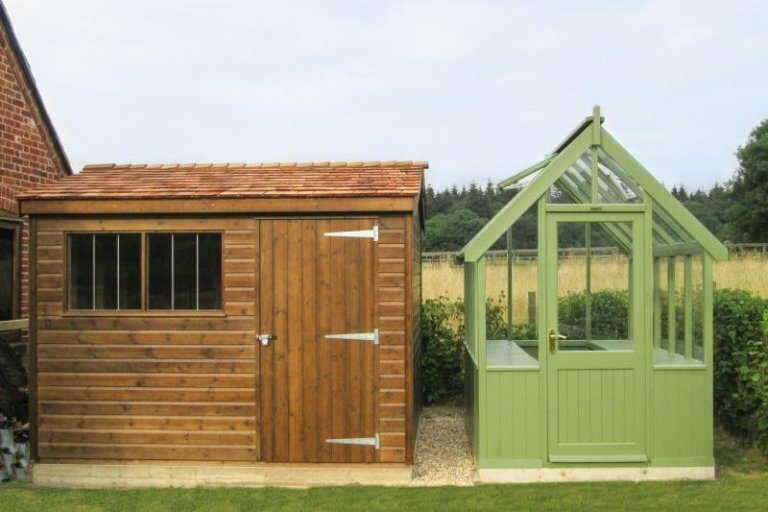 This 1.8 x 2.4m Timber Greenhouse and 2.4 x 3.0m Superior Shed have been installed next to each other in our customer’s garden in Basingstoke, Hampshire to use to enhance their gardening capabilities, giving them a place to store their gardening tools, and a place to use these tools to grow some delicious produce. This Greenhouse is the smallest size we make, although it is the perfect size for our customer and what they want to grow inside it. There are two temperature controlled vents in the roof of the Greenhouse to help regulate the temperature inside, and the customer chose to have two slatted benches in the building, which will be to sit their trays and pots on. Valtti Lichen is the paint colour the customer chose for their Greenhouse. 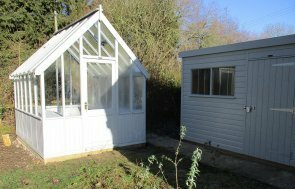 The Superior Shed differs in appearance to the Greenhouse, as the customer wanted some contrast between the two, so the shed has got cedar shingle tiles on the roof, and it has been painted in Sikkens Walnut. The customer also opted for a security pack, which consists of a seven lever lock and heavy duty sliding bolt, security screws in the door hinges, and stainless steel window bars. 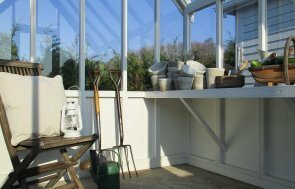 If you would like to set your garden up to encourage the gardener in you, we can help with our range of Garden Sheds and Victoria Greenhouses. Alternatively, you can call us on 01760 444229, or come and visit our closest show centre to Hampshire, which is in Newbury, Berkshire.